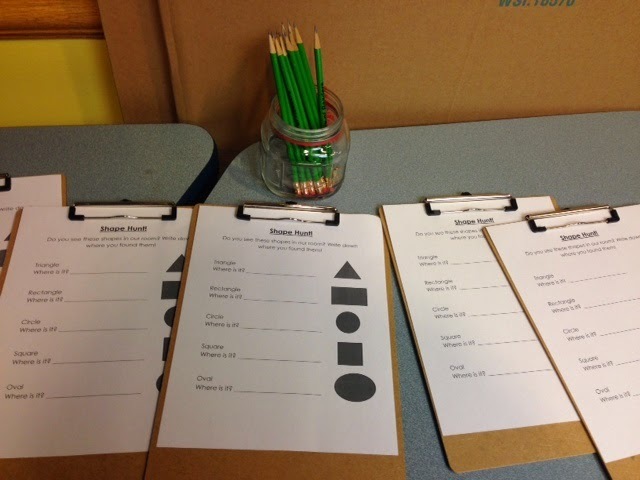 This was our first week back for Preschool Explorers and I started us off with a really easy and fun theme: shapes! Shapes probably doesn't necessarily fit within science themes, BUT it definitely fits into math (the M in STEM! ), and learning shapes is great for letter recognition later. Also, I got a great set of foam shapes and I wanted to put them to use! Opening Song: My Hands Say Hello - This is our standard opener; it signals to the kids that we're ready to start storytime. Book: Round is a Mooncake by Roseanne Thong. This picture book examines three different shapes: circle, square, and rectangle. In each spread, rhyming text talks about where we might find these shapes in the world around us. The illustrations feature a Chinese girl and her family and friends, so we see many Chinese items in the illustrations. Circles are found in mooncakes and lanterns, squares are found in a name chop (name stamp) and tofu cakes, etc. Felt: Shape name cards. We have a set with the names of shapes ("circle", "diamond", "oval", etc. ), felt shapes, and then objects of different shapes. I put all the words up on the board and then as I brought each felt shape out, asked the children to name the shape and then put it with the appropriate word. This activity helps reinforce shape vocabulary (and possibly introduce new vocabulary like "oval") and it shows children that printed words have meaning. Song: The Shape Shake by CJ (you can find it on his album "Move It!") I was introduced to this song by one of my staff members who used to be a Kindergarten teacher. We do lots of shaking and then use our hands to draw shapes in the air. It's a great movement song and it introduces kids to concepts like "horizontal line" and "vertical line", as well as practicing shapes. Book: Lots of Dots by Craig Frazier. 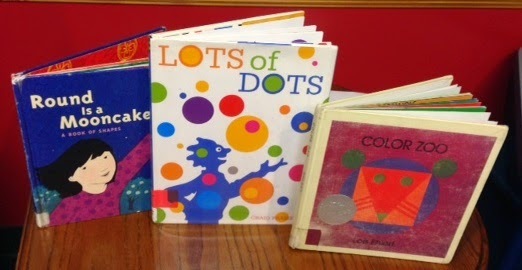 Simple, rhyming text points out circles ("dots") that are everywhere we look! I chose this book because it tied in nicely with our shape hunt station (more info below!). Book: Color Zoo by Lois Ehlert. This book introduces kids to many different shapes! Cutaway illustrations reveal different animals made up of shapes. Text simply labels each animal and as I turned the pages, I asked the kids what shapes they saw. This book also introduces octagon (8 sides) and hexagon (6 sides), and when we got to those shapes I counted the sides with the kids. Great new vocabulary! Felt: Color shapes. We have a set of different objects in different shapes (i.e. a circle clock, a rectangle door, and oval Easter egg) and I passed out a shape to each kid and then sang a little song and had the kids bring up their shape when it was called. This is a great activity for reinforcing the vocabulary we've learned and for practicing following instructions and listening carefully. Closing Song: Do You Know What Time It Is? - Our standard closing song tells kids that the storytime portion of our program is over. Time to explore stations! I got some GREAT station ideas from this article in Teaching Young Children: Discovering Shapes and Space in Preschool. Foam Shapes. I received this set of foam shapes and used them as a station. Kids could build pictures with our foam shapes. They might be similar to some of the pictures in the book Color Zoo or they might be different. We had a lot of fun abstract pictures. Handling the shapes and talking about what shapes we has was a great activity for reinforcing the vocabulary we had learned. Pipe Cleaner Shapes. 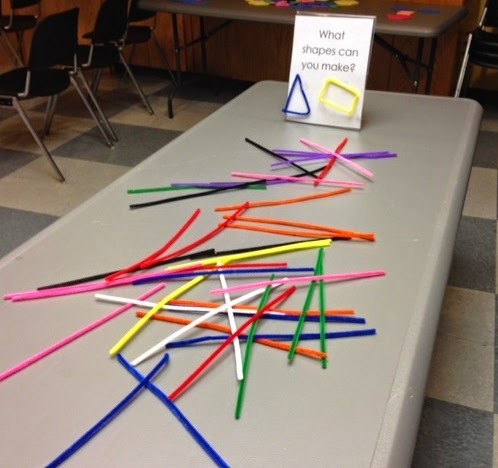 At this station, children were encouraged to make different shapes with the pipe cleaners. Constructing shapes helps children learn what makes a different shape. For example, a triangle has three sides, a square has four sides that are all the same length. Kids made many different geometric shapes and even some letter and number shapes! Shape Hunt. I made this simple shape hunt for kids and parents to do together. Here's a copy of it; I just made it in MS Word with the shape drawing tool. Kids LOVED this station. I think having the clipboards made it seem very official. I left space on there for some writing, but most of the kids simply checked off each shape as they found it. Shape Toys & Felt Board: We had purchased a shape sorting set from Lakeshore Learning and I put that out. I also put out our felt shape pieces on the board for kids to play with. This was a fun theme and pretty easy to put together. There are LOTS of shape books, so if you don't like or don't have any of the ones I mentioned here, there are plenty you can substitute. The shapes that kids had the most trouble with at our session were rectangles (they kept calling them "squares") and ovals (they kept calling them "circles"), so I was glad I had included those shapes!